Since my Sweet Potato Banana Oatmeal Dog Treats were a hit with Indigo & Lily, I decided to create another version of the recipe. I removed the ginger and added applesauce and they turned out great! Gluten-free and packed with lots of vitamins and fiber... Indigo & Lily loved them! These treats are soft and chewy and it's easy to pinch off a piece if you want to use them for training. Keep in mind they have a lot of fiber in them, so don't give too many at once! Sweet potatoes are a great source of antioxidants, vitamins, minerals and fiber for your pup (ref dogtime). Bananas have lots of electrolytes, amino acids, vitamins, potassium and fiber for your pup(ref: Paw Nation). 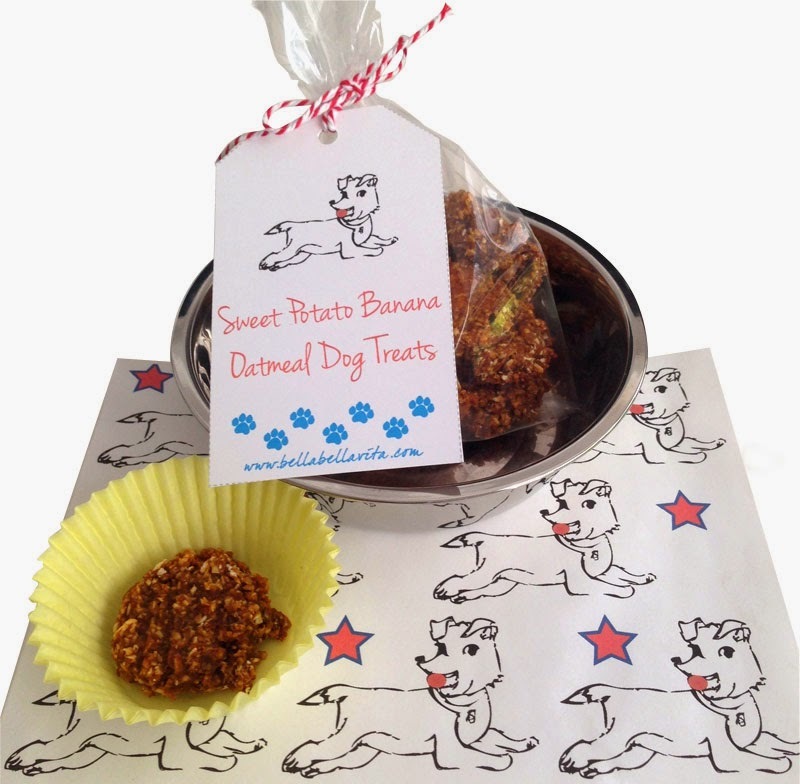 Be sure to also check out my other dog treat recipes...they are all gluten-free. Indigo & Lily love them and I hope your pups do too! Peel and chop sweet potatoes into 1/2" cubes. Line baking sheet with aluminum foil and spray with olive oil spray. Place sweet potato cubes in a single layer on baking sheet and spray with olive oil spray. Roast for 25 minutes until golden & soft. Puree sweet potatoes, banana, applesauce & molasses in Cuisinart until well blended. Add puree to dry mixture and stir well with a spatula until mixed. Refrigerate dough for at least 15 minutes (don't skip this step). Scoop on baking sheet coated with cooking spray using small cookie scoop. Flatten with a wet fork. Another option is to roll out and use cookie cutters. Bake 12 minutes. Cool on wire rack. Store in the refrigerator as there aren't any preservatives used. Should last up to 2 weeks in the refrigerator. I flip back and forth between grinding my own oat flour from gluten free oatmeal or using Bob's Red Mill Oat Flour.